Divine Comedy! Transcribed by 13-time Emmy Winner David Javerbaum, is this new, and very edgy hit play from the creator of, well, everything! Written by God. God takes corporeal form for only the second time in Christian history (it appears to be working out better this time) – in order to correct mankind’s dire misconceptions about His thinking and His works. 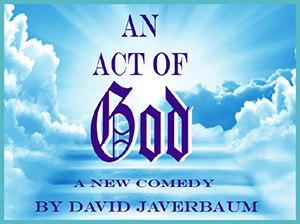 The new comedy An Act of God reveals the mysteries of the Bible while answering the existential questions that have plagued mankind since Creation – in just 90 minutes. The One with the first and last word on everything is on stage to set the record straight…and He’s not holding back!